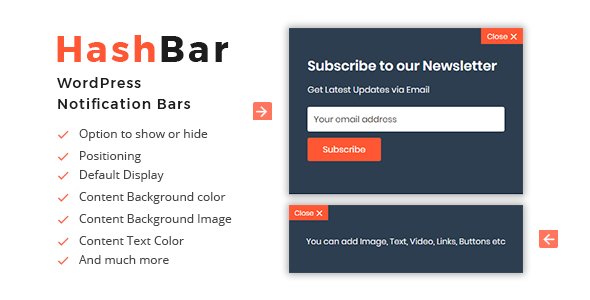 HashBar is a WordPress Notification / Alert / Offer Bar plugin which allows you to create unlimited notification bars to notify your customers. This plugin has option to show email subscription form (sometimes it increases up to 500% email subscriber), Offer text and buttons about your promotions. This plugin has the options to add unlimited background colors and images to make your notification bar more professional.